FSBA takes pride in keeping our members well informed of the activities of the Florida Legislature and in assisting you in your legislative advocacy efforts. 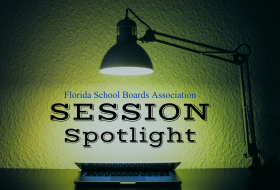 This page serves as the main source of 2019 Legislative Session information, our legislative session blog — the FSBA Session Spotlight — provides up-to-the-minute updates on legislative activities and events, and our Resource Room provides more in-depth information and background materials on specific topics. In addition, after the Legislative Session adjourns, we will conduct a series of Legislative Review Workshops and Webinars that provide a comprehensive review of the education related appropriations and legislation that are passed during the Session. School safety bill would arm teachers. But what else does it do?